8. Human Anatomy and Physiology, 10th Ed. 9. 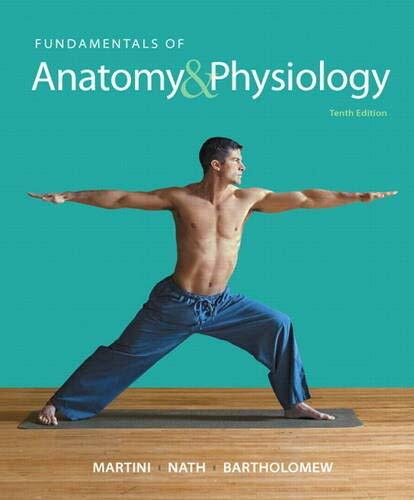 Fundamentals of Anatomy and Physiology, 10th Ed. Whether you're a nurse, nursing student, or any other type of medical professional, being well-versed in anatomy and physiology is essential for the job. Knowledge of anatomy and physiology is fundamental to all medical professions, and a highly advanced knowledge base of a particular aspect of anatomy and physiology is often required when working in a specific setting, rotation, or specialty field. Generally speaking, nursing students and medical students are usually the ones who are studying anatomy and physiology most actively. If you fall into this category, chances are you already have assigned textbooks for your class. What I have personally found useful is supplementing the required materials with some other resource, for example, flash cards or a different type of textbook that is either simplified or more specific to an area of study that I'm having problems with. Therefore, in this article, we will provide our top 5 picks for the best anatomy and physiology resources for nurses, nursing students, med students, and any other medical professional or student. While the title of this article only states "books", we will expand our selection to also include resources like flash cards. These reviews are not ranked/graded in any particular order, as we show a variety of types, and what resource is best for you will depend on your own individual circumstances. For other helpful nursing resources, check out our articles on lab values for nurses and Spanish for nurses. Also we have recently revised and updated our top lists for best hand creams and watches for nurses, don't forget to take a look! 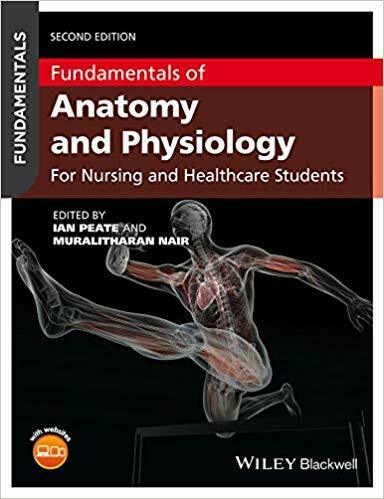 Arrived at its second edition, the Fundamentals of Anatomy and Physiology for Nursing and Healthcare Students is one of those essential books you need. It comprises a succinct but complete synopsis of the structure and function of the human body and includes an array of clinical applications and real-life examples throughout. The biggest advantage of this book designed specifically for nursing and healthcare students is the jargon-free introduction into the subject. There will be no guesswork or figuring out what the author meant to say. Another important advantage is the inclusion of over 300 colored illustrations that explain each part of the body in detail. We also like that the authors have included a list of associated conditions in each chapter. This feature provides an insight into what you’ll have to deal with once you graduate, and also explain the basics of medication. The end of each chapter also includes a series of tests, activities, and scenarios you can use to verify your knowledge. Furthermore, there is a glossary of terms you’ll use. The book is backed by online resources including flashcards, a glossary, and interactive multiple choice questions. The human body has been a mystery for long, and it’s still not completely understood and discovered. Luckily though, the advancements in medicine manage to go deeper and deeper into the matter. But this also means that the anatomy evolves; that’s why our modern anatomy books look so different from the ones used in Ancient Greece. 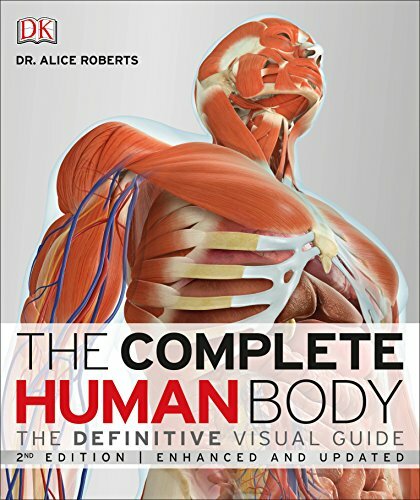 One of the most up-to-date editions of anatomy is The Complete Human Body, 2nd Edition: The Definitive Visual Guide by Dr. Alice Roberts. This book provides a deeper insight into the human body and functions than many other books thanks to the direct involvement of the author into the subject. Dr. Roberts is an anatomist based in Bristol, England, and is the author of four science books dedicated to the understanding of our bodies and evolution. This anatomy book includes a wealth of illustrations explaining everything from muscle structure to the motor pathway activities inside the brain. All illustrations are computer-generated artworks and medical or microscopic imaging, which are much more comprehensive and accurate than general illustrations. That’s why The Complete Human Body, 2nd Edition not only makes a valuable investment on its own, but it also makes a great addition to another anatomy book for a greater understanding of the subject. Anatomy and physiology are perhaps the hardest subjects you’ll learn as a medical student. For this reason, it is unrealistic to expect to understand and remember everything you’ll read in a book or study in a class. And unfortunately, the saying “ignorance is bliss” won’t do you good neither during the exams nor during practice. An easy way to learn the intricate structures and body functions is by creating visual associations with what you read. You could achieve this by looking at dozens of photos, or you could engage in coloring. If you decide to go for the latter, check out The Anatomy Coloring Book 4th Edition. This useful learning material contains extraordinarily accurate hand-drawn figures created specifically for the interactive study. I always thought human anatomy coloring books were a little silly until I actually used one. 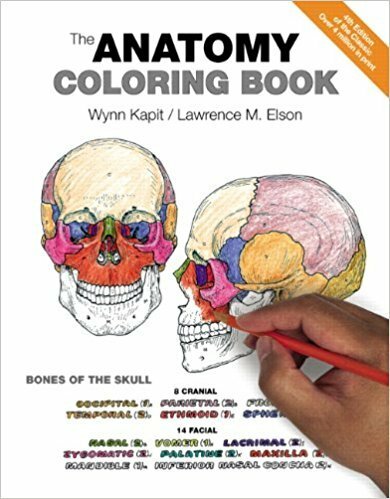 This anatomy coloring book provides a great blend between stress relief and ﻿studying, which is a combination that is tough to find anywhere else. The simple act of coloring provides a sense of calm and is actually kind of fun, but yet you're still focusing on and thinking about the anatomical structures that you're coloring. That being said, if you're not careful, it can be easy to lose focus and go into auto-pilot mode, which will end up with you coloring potentially without learning more about the actual anatomy. For this reason, we highly suggest trying to maintain focus while coloring. You don't need to be reciting origins, insertions, innervation, actions, and clinical presentations. Rather, simply identifying structures that you are coloring might be good enough. For example, let's say you're coloring the extensor digitorum muscle in the posterior compartment of the forearm. When you're coloring the muscle, just paying attention to the general area of origin and insertion can help you remember that information during a test, or at least reduce the number of possible selections. Another thing I found helpful was to try and color code structures based on something meaningful. For example, with muscles in the forearm, this could be color coding by innervation, or if you're coloring the ribs, you may want to color code by true versus false ribs, or something of that nature. For me, I found having a highly visual learning experience like this was able to help me recall information more quickly on a test and confidently on exams, but I do recognize that everyone has their own study style. In regards to this human anatomy coloring book itself, this one is what we would consider to be the gold standard. There are some other coloring books available, but this is the one I've seen in most book stores and is also widely available online. Chapters are generally organized by system (e.g. muscular system, nervous system, etc) and then by regions of the body. One nice aspect is that they provide a decent amount of information throughout the book, leaving space for you to write your own notes as well. The information isn't too detailed, but it's a nice way to keep your brain focused on learning while you enjoy the coloring process. Overall, this is a great study tool for nursing students, med students, or any other student or profession in the medical field who wants to brush up on their anatomy in a way that's more fun than simply reading a textbook. The information isn't overly comprehensive, but the main idea here is that you can identify and briefly explain all of the anatomical structures, which the visual representation is a key factor. So while it won't serve to address the full curriculum of a nursing or med student, it is great as a supplemental study tool to boost your understanding of the material. 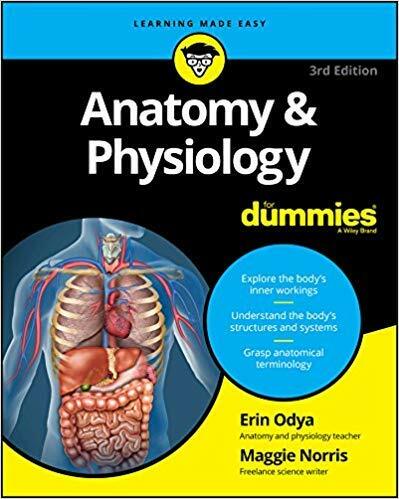 The Anatomy and Physiology For Dummies by Erin Odya is a book dedicated to all those students who find it hard to understand medical jargon and tricky terminology. The author aims to help you understand how the human body works instead of focusing on teaching body part names. The anatomy side of the book explains the anatomical structures from head to toe in such a simple way that it’s easy to understand even by someone who’s not studying nursing. This book offers a fun and easy way to help you handle the fundamentals of medicine. Turning to the physiology side, this volume focuses on exploring the interaction of the various body systems without including too much medical jargon. This book for dummies will give you an insight into how all these structures and systems work, both in normal conditions and during sickness. All explanations are complemented by enhancing illustrations, and this is undoubtedly one of the greatest anatomy and physiology books to consider. If a theoretical anatomy and physiology book is the first step towards learning this difficult subject, a workbook can work wonders; it can help you gain a deeper understanding of what you’ve learned so far and gives you a great way to test your knowledge. 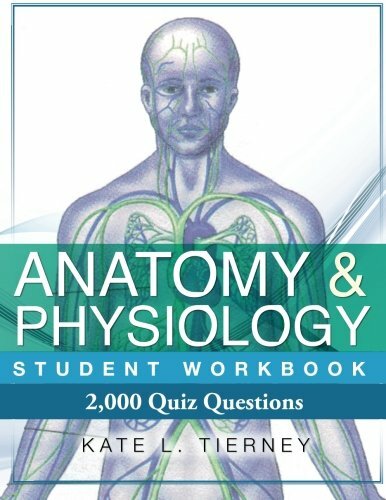 Our favorite workbook is this Anatomy & Physiology Student Workbook: 2,000 Puzzles & Quizzes 3rd Edition by Kate L Tierney. It contains a total of two thousand puzzles and quizzes divided into 13 chapters. Each chapter is dedicated to a different body system. Series of multiple choice questions, word search puzzles, crossword puzzles, as well as true/false quizzes and a variety of other engaging games and activities will help you understand which parts of this subjects you already master and what you should focus on. The author also included the answer to each test at the end of each chapter. All tests included in the workbook are meant to be repeated for as many times as necessary so that you can become an expert. Anatomy flashcards are another great supplemental study tool to help you learn human anatomy. If you are a nursing student or med student, you may already be familiar with these, but chances are they are not listed as a required "textbook". Some sort of anatomy flashcards may be available at your institutions bookstore, but as you may have already learned, any items found in bookstores at colleges and universities tend to be way overpriced. Kaplan is a very well-known and reliable education company that offers a variety of textbooks and other study materials for health care professions. For example, they publish one of the most popular NCLEX-RN review books currently on the market. 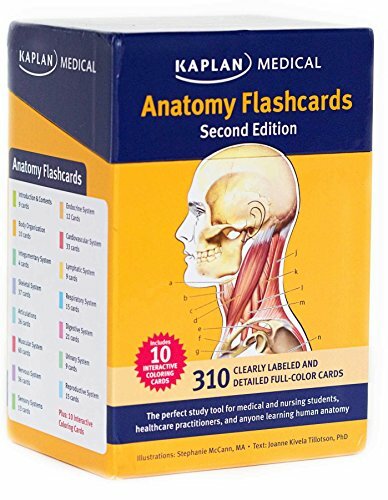 Regarding these anatomy flashcards specifically, the Kaplan version offers a mid-range standard package that is very well-liked overall. By flashcard standards, the Kaplan Medical Anatomy Flashcards are available online at a mid-range price point. They offer a good amount of information without adding in too much potentially confusing detail. This set comes with 300 anatomical illustrations that are clearly labelled and in full color. More detailed explanations are found on the reverse side of the card, allowing you to learn as you quiz yourself and identify your strengths and where you need to improve. Overall, this is a great set of anatomy flashcard without any major complaints. Any customer complaints are usually based in minor personal preference issues. For example, if you want them on a ring, you will have to punch your own holes, and some people were hoping they would come with a section on cell composition (which they don't). However, those minor issues aside, these are a great set of flashcards that we would highly recommend for any nursing student or medical student who will be examined on the material. Lots of times it's easy to think that in order to understand the material better or more comprehensively, that it's best to dive into deeper detail. Sure, this can help sometimes, but personally, I simply find mixing up the source of material to be just as helpful. If I have a loose understanding of a particular concept, I find having that concept explained in a more simple sense can often help. Whether I'm over-complicating things, or just simply didn't realize that I was overlooking something fundamental, having more than one soruce of information presented in different ways is usually helpful. One nice thing about this particular book is that simplifying the information generally leads to a smaller book, and subsequently, a much lower cost than a formal and more comprehensive textbook. This book provides an overview of the main concepts in pathophysiology and the mechanisms of disease, which is designed to ease the transition from basic science to clinical applications. Depending on your curriculum, this is a great book for med students who are transitioning from 2nd to 3rd year, and is also suitable for nursing students. Overall, we think this is a great tool to supplement your learning, either by reading before diving into more detailed concepts, or to simply re-affirm your understanding of a particular concept. It's extremely well-reviewed by medical students and nursing students alike, and fortunately, it's also highly affordable, especially by textbook standards. 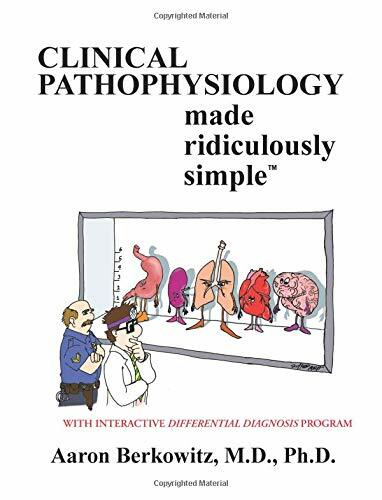 We highly recommend this book if you want an extra tool to further your understanding of clinical pathophysiology. This is where we will start getting into the more formal textbooks. Human Anatomy and Physiology, 10th Ed, is an extremely comprehensive resource for learning human anatomy and physiology. Given this is a beefier resource, it comes at a much higher cost than a coloring book or flashcards, but you have all the information you need in one spot. If you already have a required textbook for course, it could be difficult to justify spending the money on a completely different textbook as well, but if you have flexibility in what book you choose, this is a great choice. One of the authors, Dr. Marieb, has taken the student perspective into account when writing this textbook, which helps bridge the gap between basic science and its application in a clinical setting. After receiving a PhD in Zoology, this author then went on to receive her nursing education with a specialization in gerentology, so her perspective may be especially useful for nursing students. The other author, Dr. Hoehn, is and MD and Professor in Canada. With a PhD in pharmacology and a wealth of experience in teaching, especially in the physiology domains, Dr. Hoehn offers a reliable and experience-based source of information that students can count on, and having two authors compliment each other's styles is always a good thing in our opinion. Some people have found that they are happy with a previous version of the book that can usually be found for a little cheaper, but the 10th edition does come with more detailed information, which can be expected as new research updates our understanding of various physiological concepts. Overall, this is an excellent textbook for anatomy and physiology, especially for medical students or nursing students. Every textbook of this status will have very knowledgeable authors, but this is especially true in this case, as the authors combine to provide a wealth of expertise while still incorporating the student perspective and maintaining a down-to-earth practical approach to learning anatomy and physiology. This textbook is fairly similar to the Human Anatomy and Physiology textbook that we reviewed above, both in terms of comprehensiveness and cost. This is a more formal textbook that may already be required for some of your courses, but if not, is suitable as a helpful study tool for anatomy and physiology. If you're a nursing student or medical student who is already extremely busy keeping up with required readings and other tasks, then you probably won't have much time to work through this textbook. However, if you have flexibility in the textbook you choose, or do think that you will benefit from a supplementary study tool that is just as comprehensive, if not more, than your current textbook, then this can be a great option. There are three author and two illustrators involved in the creation of this textbook. Dr. Martini received his PhD from Cornell University and has been highly involved with the Human Anatomy and Physiology Society (HAPS) at the highest ranks, and has contributed to many other similar texts. Dr. Nath is a biology professor at Lourdes College and teaches anatomy and physiology, pathophysiology, medical terminology, and pharmacology, so this is right up her alley, especially as she strives to provide information that is both meaningful and interesting for the students. Ed Bartholomew also teaches anatomy and physiology at a secondary and undergraduate level, and hs experiences with a range of students provide further value to this textbook. Overall, this is an excellent textbook to further your understanding of anatomy and physiology. It can be found much cheaper online than in most school bookstores, but one thing to note is that some students find the kindle version to be pretty bad, so we would play it safe and go with a hard copy. Also, this textbook is fairly similar in layout to other textbooks published by Pearson, so if you really like or really hate other Pearson textbooks, we would definitely include that as a consideration. Otherwise, if you're open to a range of textbooks, this stands out as one of the top options. Shopping for an anatomy and physiology book could seem simple. You might think that all you have to do is pick an author and edition, and you’re ready to go. The truth is that there are three types of books. Each serves a different purpose, and if you want to become an expert in the subject, you need all of them. Theoretical books: They are the basis of anatomy and physiology learning. These textbooks study each body system in detail and help you learn the basic principles. Illustrations complement the explanations so that you can have a better understanding of what’s being described, and these books will usually be your first contact with the medical world. Coloring books: Can be defined as a hybrid between a theoretical and a workbook. They still contain explanations, but come with black and white illustrations of each body structure, which you will then have to color in a specific hue. These books aim to help you visualize the concepts and create associations between theory and actual body parts. Workbooks: These books are designed to help you test your knowledge. They contain exercises and tests you can repeat for as long as necessary until you become a master in the field. Workbooks can also replace color books and sometimes even theoretical books if you find it easier to learn by trial and error. When it comes to choosing the best anatomy book for nurses, you can’t just pick the first and hope for the best. Here are a few things to keep in mind. Your professor’s requirements: Before even starting to scour the market, find out if your professor or lecturer has specific requirements. Some of them are particularly fond of certain authors, and will only accept the indicated books in their course. The good news is that you’ll be able to leave guesswork out of the game. Just buy the book they indicated, and you’re all set. Your level of understanding: If nobody requires you to buy a specific book, consider your level of understanding. Is anatomy completely new to you, or do you have a slight knowledge of the subject? Could you handle a book full of medical jargon, or would you be better off with a simpler language? You can’t learn how the body works if you don’t understand the terminology, so buy a book you’re comfortable with. The type of learner you are: How do you like to study? Whether you prefer studying alone or with a bunch of mates, there is undoubtedly the right book for you out there. 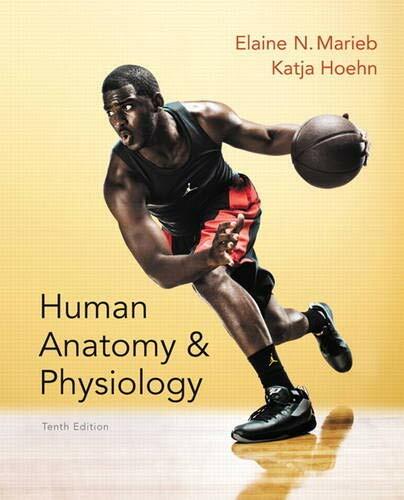 Some of the best anatomy and physiology books are even designed for audible or visual learning. Writing style: Authors can write in dozens of ways. Some are formal and maintain strict terminology in their writing. Others use a conversational tone. A handful of authors are even humorous. As long as the book incorporates all chapters and an adequate level of detail, you can pick whatever writing style you want. Anatomy will still be the same, but reading something you like will make learning it a bit more enjoyable. Additional resources: These can include anything, from online resources to video CDs or even subscriptions to magazines or almanacs. More often than not, these resources will give you further insights you might not have had without them. So, if possible, get anatomy and physiology books that come with bundles or perks.